The level of confidence associated with respondents’ honesty continues to be a concern, and there was no shortage of coverage at the conference. Dishonest and bad data has plagued the industry for years and continues to impact the quality of research. Dishonesty comes in several forms: bot fraud, a less than truthful respondent or a disengaged survey-taker, among others. Attendees discussed how each of these factors affects the panels and the steps they take to try to mitigate the risk they pose to their product. It is clear that we must work diligently to combat the effects of respondent fraud, such as extensively testing your supplier network or implementing in-house fraud detection tools. Working with a trusted network to ensure we remove any fraudulent data from our research is critical. Another highly discussed topic was respondent engagement. And let’s all be honest for a second…data collection isn’t the most glamorous part of market research. Its importance, however, cannot be understated. A finite world of potential respondents exists, and to ensure a sustainable resource, we need to treat panelists fairly and engage them appropriately. A major talking point of SampleCon is learning how to find and maintain a balance that keeps both players in this game happy. Whether through new questionnaire techniques, increased compensation, non-survey activities (such as games) or limiting the number of surveys a respondent can take and/or terminate for within a specific timeframe, panels are looking for ways to increase the longevity of each respondent’s tenure. Senior leaders of multiple sample providers debated the merits of each approach, with some leaning towards financial drivers and others looking for more fun and creative solutions. Technology is always at the forefront of SampleCon, due to the constantly changing world of online data collection. From discussions around surveys via in-home voice assistants (think Google Home or Alexa) to presentations on passive metering, attendees had no shortage of ideas for disrupting the marketplace. The most common of said ideas was passive metering, or tracking respondents’ online habits. Once a respondent opts in to the service, the panel would then start tracking the websites they visit, the amount of time spent on each website, and any other digital activities. While researchers are still learning more ways on how to leverage this immense amount of data, it is already being used to help provide direction and probing questions to surveys in the marketplace. As this technology becomes commonplace, expect to hear more exciting ways to integrate new findings into traditional marketing research! 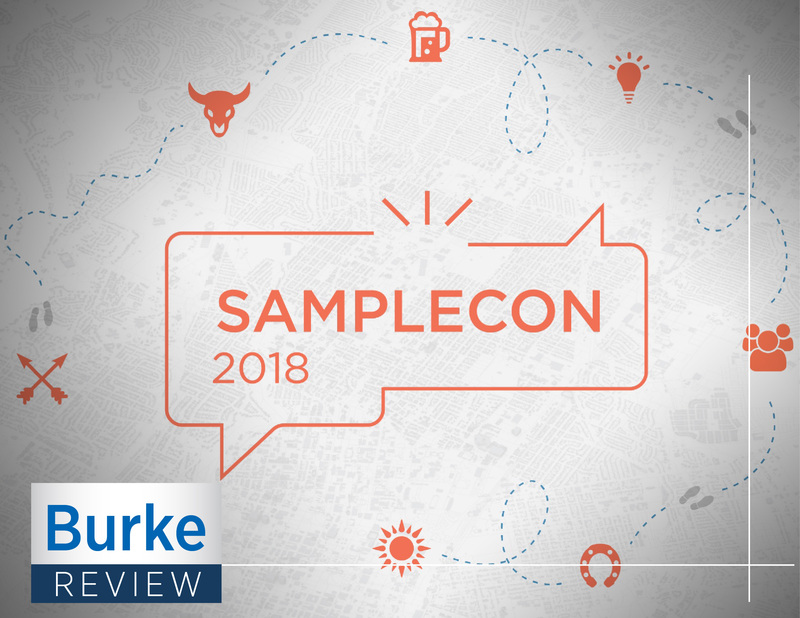 All in all, SampleCon provides a great opportunity to keep a finger on the pulse of the sample industry and stay informed on potential new exciting developments. As a Senior Project Manager in Burke’s Sampling Department, Scott Harvey collaborates with a network of online panel providers to help find solutions to clients’ data collection needs. He is passionate about keeping up-to-date on developing trends in the data collection industry, as well as researching their potential fits in Burke’s sample portfolio.